Madison, Nevada, is a town in the Mojave, so small and inconsequential a driver shouldn’t blink as he drives past or he’ll miss it entirely. No one stops there except to get gas before going on to Las Vegas or bigger and better places. Madison has only one thing going for it. On his 18 birthday, everyone gets one wish. That wish always comes true, and changes the life of the wisher forever. Making a wish also binds a person to the town because wish-magic doesn’t work outside Madison’s boundaries. Eldon Wilkes’ birthday is coming in 26 days and he has yet to decide what he wants. His mother wants him to wish for money so she can find a doctor for his sister, Ebba, who was struck by someone hurrying to make his own wish and now lies in a coma. Eldon knows no amount of money is going to make Ebba well, so he’s dragging his feet about wishing for that. Besides, he’s seen how wishes can ruin lives as well as help them. His dad wanted to be the best football player in his high school, forgetting he was only months from graduating. His mom wanted his dad to love her forever, not realizing she’d soon tire of all that adoration. His friend Merrill wanted good eyesight so he could be a pilot, but he still wears glasses because he feels odd without them. The mayor wished to always be mayor of Madison and so far, he’s won every election. As his birthday nears, Eldon is placed under more and more pressure and not just to decide on his wish. His girl, who’s now the most beautiful girl in the school, has dumped him for the guy who’s taken his place on the football team. Eldon’s star is sinking fast, and he doesn’t know if it’ll ever rise again. Anyway, there’s something sinister about the way the wishing ceremony is conducted, with the mayor and his bodyguards present and the entrance to the wish cave padlocked until the actual day. Why are bodyguards needed in Madison? It’s said they killed a couple of guys who refused to make their wishes. When Eldon crosses the mayor by allowing out-of-towners into the wish cave, he’s told he won’t be allowed to wish. That makes him more determined than ever to do exactly that, and determined sure the outcome is one he can live with. Be careful what you wish for, because you may get it, is a very famous saying. It should be: Be careful how you word your wish, for it may be granted literally. In spite of the magic involved, Eldon and his friends are typical teenagers, filled with the angst of leaving adolescence and entering the adult world. They have their bullies, their wimps, their friends, role models, and homework problems—all while dealing with the problem of deciding on that one special wish. The sequence of the story is broken by flashbacks in which the histories and wishes of various Madisonites are chronicled, telling why they wished as they did, and how they are now living with the results. Unfortunately, both story and flashbacks are told in first person present tense. In the end, Eldon’s choice may seem the only one he could make. Because of that, the ending may be a bit of a let down to those who always want a happily ever after, for author Sedoti injects enough doubt that the reader may wonder if another decision could have been reached. 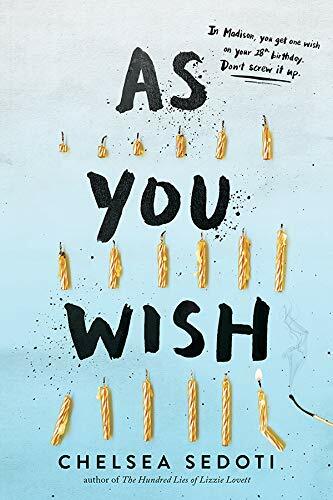 As You Wish is a refreshingly different and innovative young adult fantasy with a very original premise.